This semester – Spring 2014 – I experienced a first in my teaching career. While we were reviewing the course outline for my first year earth science class the students broke out into applause. Now, I flatter myself to think that I’ve had some successes in the classroom, but I’ve never experienced a room full of students applauding my course structure decisions. The reason? I am not asking the students to buy a textbook this year. When I planned my course I didn’t think going text-less was that revolutionary, but the reaction from my students suggests that it must be out of the ordinary. Over the past few years I’ve had a growing dissatisfaction with the traditional textbook. Don’t get me wrong: I love books. I have an office full of them and I frequently buy them for my own reference. But my courses don’t follow any text that I’ve ever tried to use, and I believe the traditional hard copy text as a teaching tool, especially for introductory classes, is devalued by the myriad of web resources now available. 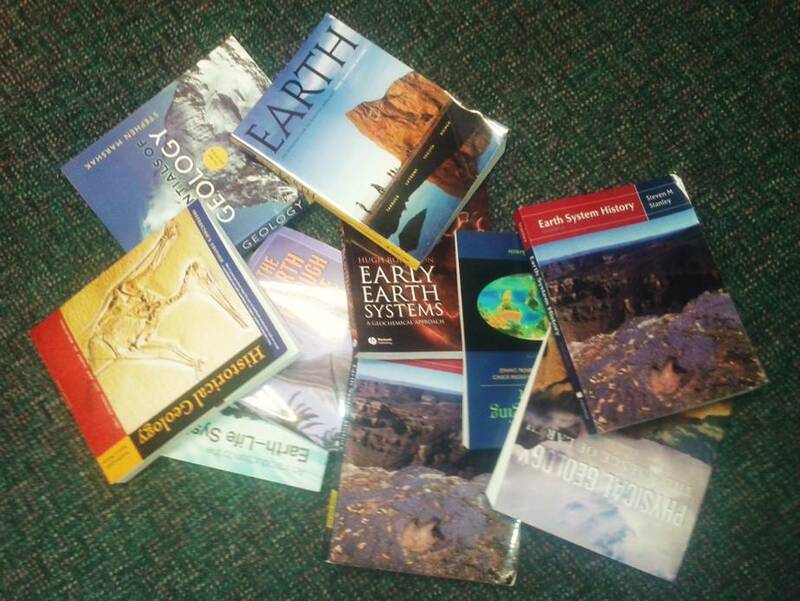 Typical book costs to students for first year earth science texts are on the order of $150. I think that costs are comparable across most science disciplines. E-books purchased from textbook companies still cost students upwards of $80, but are only available for a limited amount of time. When I announced that there would be no textbook one student actually shouted “Yay! I can eat this month!”. At a recent professional development discussion group we talked about the challenges associated with keeping students motivated. It turns out that in order to be motivated in the classroom students must not be preoccupied with how they are going to meet their basic needs for food, shelter, and safety. At best, my decision to go text-less may reduce the financial burden on students, and will hopefully pay dividends in terms of their motivation. At the very least it shows them that I care. To prepare for my first text-less semester I invested a bit of time reviewing the print and e-materials at my disposal. Assigned readings for my course are sourced from a combination of a free online text (Earth’s Dynamic System Web Edition 1.0), some interesting articles, and a few chapters scanned from a variety of texts, in accordance with the VIU Copying Guidelines, to fill in the gaps between that text and the content that I cover in class. The web resources aren’t perfect – but neither were the texts that I’ve asked students to buy in the past. All of the readings are available on our course D2L site as PDF files or links. The students can either choose to go paperless, or print the chapters. Whatever works better for them. Open Texts – The future of knowledge sharing? It looks like traditional texts might truly become obsolete as a teaching tool. An ongoing project that I’m really excited about is the Open Textbook Project, sponsored by BCCampus. The goal of this project is to source, re-purpose or create quality open source texts for the 40 most highly enrolled courses in British Columbia post-secondary institutions, including Year 1 Earth Ocean & Atmospheric Science. Instructors (and anyone!) will be able to take these open resources and modify them in any way they see fit to suit the courses they teach. I hope I am able to participate in this process somehow, and perhaps adopt the resulting work as a text for my first year course. Easier access to more knowledge for students and citizens will make our job as educators easier, help reduce the growing problem of university graduate debt slaves, and hopefully make the world a better place.